And it wasn’t even raining here today but it sure felt like it was raining on my little parade. I set off to the gym to take the 5:30am 24-Lift Class which I love but haven’t been able to take because of early morning conference calls. I got there at 5:25 and the class was already in full swing, hmmmm….check schedule, yep 5:30. Oh well, I’m a few minutes late, it will be good anyway. Into the weight room I went only to find there were no clips to hold the weight plates on the bars and the lightest hand weight they had was 10 pounds. I know that sounds pretty light but when you’re swinging your arms around, stepping up and down on a step 10 pounds becomes a deadly weapon. That and the fact I’d have to do a lift class without a weight bar seemed kind of pointless so I left and did my time on the elliptical. I had to head into the office to gather up the last of my belongings and do a little clean-up after being out for a week. My laptop started stuttering and distorting an hour after I’d turned it on. After rebooting a couple of times and missing an important demo call, I packed it in and headed home. I reported trouble and was told I would hear from someone by 6:00…well that really kills the day. Reading email on the BlackBerry leaves something to be desired. Someone mentioned my computer overheating last week and suggested it might have something to do with cat hair…really cat hair in my house…no way. Then I remembered a co-worker who had the same problem and it turned out to be dog hair clogging her fan. Enter the super suction vacuum and I was back in business. So much for IT, who, by the way, never called me back. By the time I was back in business I needed lunch…a delicious fall salad with a chopped pear, toasted pecans, and arugula was in order. Dressed up in olive oil and champagne vinegar…yummo. Ate it too quick to be photographed. 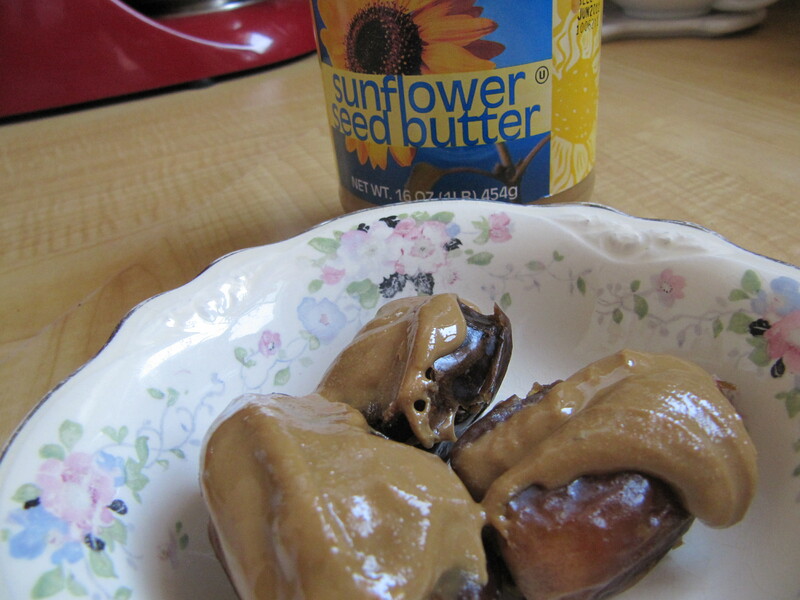 I did pause and take a picture of my snack of 3 dates stuffed with TJ’s sunflower butter. And speaking of good meals…mom cooked an awesome batch of minestrone, cornbread and salad just because I picked up dad from the airport. I forgot my camera but it was from the Fix-It and Forget-It Cookbook…too tasty and she kindly set aside the bleu cheese for the salad. Thanks Mom! Dates always remind me of cockroaches…sweet and yummy cockroaches, but cockroaches nonetheless.